Office 365 is capturing the imagination of people and organizations more with each passing day. And to be fair, it does seem worthwhile to switch from traditional on-premise email to the growing Microsoft cloud. The main attractions that lure organizations to migrate Exchange to Office 365 include easier management, elimination of the capital cost associated with running the Server edition and the management overhead associated with it. Read on to know more. This article will help you in taking care of at least one of these per-requisites, viz., choosing the correct method for Exchange to Office 365 migration. This could prove to be the most crucial make-or-break decision while performing the migration. There are various migration methods to choose from depending on different factors. These factors include the number of objects involved, the amount of data to be moved, the version of Exchange Server running on-premises, long-term co-existence or migration requirements, whether the organization uses non-Exchange email servers or not, and even the budget available. When all mailboxes residing on an Exchange server are migrated to Office 365 at once, the migration technique employed is called Cutover Migration. This migration method should be undertaken if there are fewer than 2000 mailboxes. Additionally, if your current Exchange version were 2003, 2007 or 2010, this migration technique would be best suited. The main advantage of this method is that it is very simple as the migration is done for all mailboxes at once. However, it suffers from the disadvantage of taking longer time if the mailboxes are huge in size. 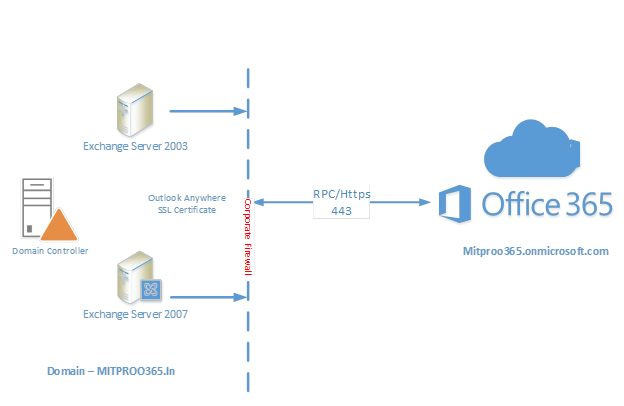 When Exchange mailboxes are migrated to Office 365 over time, the migration technique is called Staged migration. This migration technique should be used when there are more than 2000 mailboxes and the current Exchange version is 2003 or 2007. 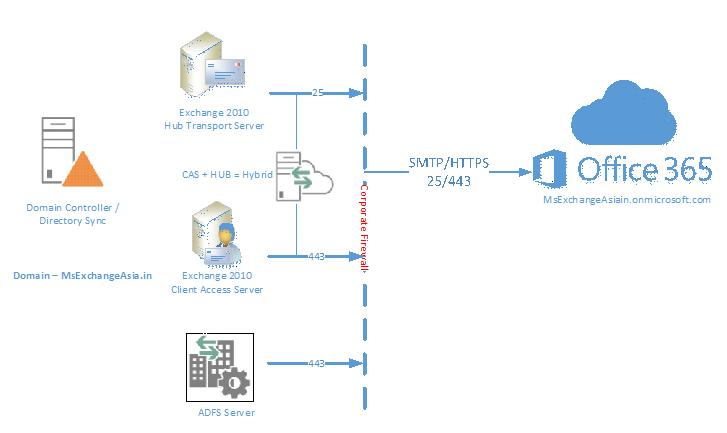 This method cannot work with Exchange server 2010 and 2013. A staged migration requires you to adhere to some infrastructure requirements. For instance, you'll need a server running Active Directory Federation Services. This server handles identity management between the two environments. Additionally, this migration requires directory synchronization to be implemented. When there is a need to maintain both on-premises and online mailboxes for the organization and also to gradually migrate users and email to Office 365, the migration method undertaken is called Hybrid migration. This migration technique should be used when you have more than 2000 mailboxes and you current Exchange version is 2010 or 2013. Also, this method is beneficial for migrating small batched of mailboxes over time.Hybrid migration also heavily relies on directory synchronization. This migration method is the most flexible one but is also considered to be the most complicated. If neither of the above migrations can be performed or there is a need to migrate mailboxes from non-Exchange mailboxes like Gmail, an IMAP migration is undertaken. This technique is often used as a shortcut for migrating mailboxes from outdated Exchange Server versions (Exchange 2000 and newer are supported). This migration method is capable of migrating only the items in the users' inbox or other mail folders. Contacts, calendar items, and tasks can't be migrated with IMAP, but they can be by a user. Also, IMAP migration doesn't automatically create mailboxes in Office 365. You'll have to create a mailbox for each user before you migrate their email. If you’re in a position where you can’t perform any of the above-mentioned migrations, you will need to consider third-party migration tools. Alternatively, instead of migrating mailboxes, you could employ a simpler technique of converting your offline EDB (Exchange Database) files to PST files that can be imported into Live Exchange. For this, some great EDB to PST converters are available online, Stellar EDB to PST Converter being excellent choice. So the next time you’re in need to migrate Exchange to Office 365, you should list down your requirements and select the correct migration technique from the ones mentioned above. And if you face any issues, you could go with the simple conversion of EDB to PST files using a great converter like Stellar EDB to PST Converter.